Since this article will be the very last one to be published about Decenternet in foreseeable future, the time has come to finally tie the subseries to the main “Decentralization to the Rescue” series. Decenternet – What have we learned so far? So far we have done an in-depth review of all the Decenternet’s fundamental elements. We have thoroughly studied its vision, where it remained sober and where it aggrandized quite a bit. We have studied what the author deems as the most valuable resource on the planet and found few contradictions in his belief. We have uncovered what there was to uncover about the governance of the whole network and what underlying purpose the spyce token will play. 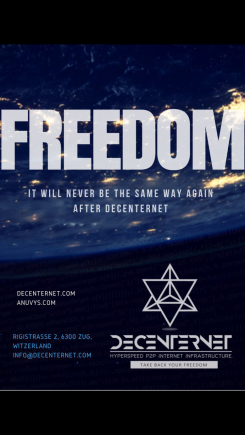 We have briefly introduced the software and platforms, namely Anuvys, Liberty and Osiris, that will play a vital role in Decenternet’s network, for there was not much information to be revealed. We have even went through all the available information about its architecture, despite the fact that most of the information about it, if it even exists, isn’t disclosed as of yet. Internet is a network of computers connected to each other through cables and wireless connections (short-ish distances). Those components form something we call cyberspace – Planet’s neural network. It sort of exists outside of what we perceive to be 4D reality, where the 4th dimension is time, for it doesn’t have any effect on this network (apart from the physical material that created the network). We do not enter this cyberspace, rather our virtual hashes do. It is quickly forming today’s information society. Internet has its own Core network. Imagine those as the core cables that are in possession of private companies and serve as the very roots of the internet we know. Then there are National and Regional networks. As the name implies, those parts of the network already belong to the states. We can also imagine those as centralized hubs, that have to give permission to any give information to access the last part of internet’s architecture, which are local ISP providers (in our country it would be for example UPC, O2 etc.). The internet uses TCP/IP protocols. In a nutshell, those protocols define the connections between individual nodes, the way in which information will be transferred (network packets) and defines what IP is. The IP is basically a name of a network source. Those can be either stored on physical storages, or on cloud storages. Any node can address those sources either through their real (IP) name, or through a more intuitive domain name. DNS (domain name server which again belongs to centralized entity) is contacted whenever you search for any domain. It then in return sends the associated IP server, which is then contacted by your browser. That is pretty much how internet works (it gets complicated if one goes deeper into its protocols and stuff of course). Decenternet – How is it any different? Any reader should probably be able to guess that Decenternet is not going to build everything from a scratch, nor they ever claimed that to be the case. So what exactly will be different? Let’s start from what will remain the same. Obviously, the Core network has to remain the same for multiple reason (mainly the difficulty of setting up new Core network). If Decenternet wants to share information across continents, it basically needs to connect to it. If the Decenternet would want to be FULLY decentralized, those cables would need to belong to all the users too right? But creating fully decentralized ecosystem isn’t something that is in human capacities as of yet. All the current consensus (POW/POS/DPOS) mechanisms have their own “centralized” maladies. But let’s presume that those corporations wouldn’t want to ruin our semi-decentralized fun for the sake of this article. The trickier part now begins. There are two main centralizing components of today’s internet. It’s the National network and DNS. Those have to be bypassed. But how is it going to happen? The whitepaper doesn’t state it! This is crucial! Or is it not? If not, then please educate me:). There is a passage in the whitepaper, which helped me to visualize how the devs plan to run with their idea. In the architecture and POR explanation, I showed you how the platform plans to reward all kinds of contribution, such as lending internet speed, storage capacity, computing capacity etc. Now what is important to realize is that with the right set up, decentralized internet can bring forth much bigger speed and reliability than the internet of today. As I tried to explain in the previous chapter, current internet has centralized hubs through which the information has to flow. One can imagine how this “architecture strategy” (for lack of better words) centralizes the environment at the expense of speed and reliability. This is only logical, for the ISPs overall provide their services through thousands (tens of thousands? Hundreds of thousands? I don’t really know) top notch servers (nodes). Realize how this set up is no longer peer to peer as it used to be back in the days of Arpanet. 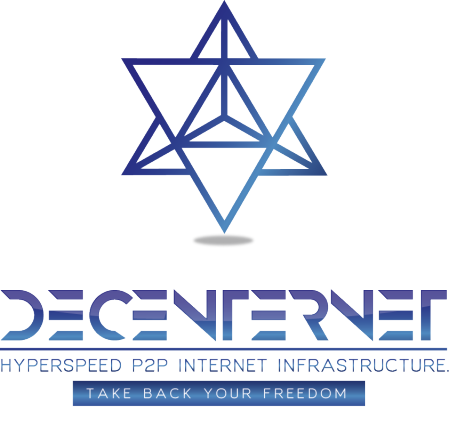 Decenternet on the other hand will try to recreate the fully peer to peer environment, with few tricks here and there to unlock the potential hyper-speed. Millions (tens of millions and possibly more!) nodes, that will be carefully selected due to the POR mechanism, will connect and create very effective local architectures. Decentralized architecture needs to be well structured to outcompete the today’s internet. To my mind comes the need of strategically positioned storage nodes to start with and very high activity of the community to end with. There is obviously much more to it, but those two are imo one of the most important mainly when we want to successfully operate with highest speed possible across continents. If the platform got adopted by millions of users across the globe, the Decenternet’s speed could destroy the speed we are used to accept today by more 10000%. The calculation has been done on an example of an average internet connection in South Korea. One node there can send about 60.58 MB per second. Sending a 100 MB video would then take about 1.65 seconds. Now imagine a decentralized ecosystem of 4 millions of copies of that node. Those nodes would accomplish the task in 0.0000004125 seconds. The calculation is simplified to be honest, nevertheless it’s insane! If you want more information go to the whitepaper’s page 46. Decenternet is not only the new internet. It is one of the most ambitious decentralized projects up to date. The fact that Arpanet supports the team and the project speaks highly of them. Their vision is noble in my book. From my perspective even if they ONLY created a decentralized Anuvys OS, it would be a great success already. Basically any part of the project that would be successfully released would be a huge success. On the other hand, the whitepaper didn’t manage to explain how is the Decenternet going to bypass the centralization of the “National network” which is directly connected to the Core network that we need to access in order to fulfil this vision (at least that is my premise…feel free to refute it! ), or possibly even the local ISP providers. I simply didn’t get it and I find it strange. Not that I would find strange that I didn’t get something lol, but I find it strange that the whitepaper doesn’t explain something that is the very issue that is being solved as far as I understand this visionary project. It feels to me like if the current monopoly is going to comply, we can use its network to create much stronger and more effective network. Then again is that really true? Why wouldn’t Bitcoin be shut down in the very same way as I fear Decenternet could be? What is the difference between those two projects in this regard? Maybe I’m still way too young and with insufficient knowledge to understand this. It feels important yet the knowledge is simply out of my reach so far. If there is anyone that would be willing to explain this to me, or navigate me to credible source I would be most grateful. Let me finish the whole series with a catchy quote. Your post was upvoted by utopian.io in cooperation with oracle-d - supporting knowledge, innovation and technological advancement on the Steem Blockchain. At long last you showed me some love too:) Im super grateful for that! WOW! Upped, resteemed and followed. What we need is a new computer, which I have conceptually designed, a new data transmission system, which I have also designed, a new placement for this system, an international hub, a gateway to the stars, which I have also designed. Welcome to Project Liquid Universe. The new data transmission system I am referring to will replace the Internet. That is what I am suggesting. I need to explain it better after I compose an article on this. Thanks. cool! Well if you made that clear from the start we wouldnt have this little disagreement:) Feel free to share it on any of my posts when its ready. 2 – The Most Valuable Resource on the Planet and How Spyce Is Connected. 4 – Architecture and Governance. 5 – Decenternet Vs. Internet. Just wait and you shall see. Your mind is made-up without viewing the facts. The easiest thing to do when confronted with a truth that hurts is to downvote. Nothing you have so far said has anything to do with something that could be perceived as rational thought...explain how the things you said are connected (they are not I have read the article you have promoted here)...If you manage to do so then I will gladly remove my flags...until then I will do my best to remove such an engagement on my articles...I want quality comments to be promoted. I have no need whatsoever for the opposite here:). When information on the referred to project is posted, it will make sense. It is all connected and related to the items outlined. Assuming it is not just because it is not evident at this point is not a valid way to do things. Everyone is free to have an opinion but it is harmful to censor or criticize others simply for sharing the truth. Your article is about de-centralization to the rescue yet you promote censorship, flagging of others and the like. You actions contradict the contents of your article.